Seasalt located in an award winning building, looking seaward just 50 metres from the harbour in the vibrant village of Charlestown - one of the most fascinating places in Cornwall. 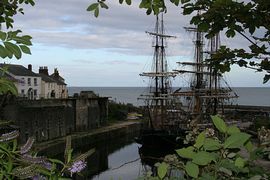 Today, recently designated a World Heritage Site, the Grade II listed harbour is a unique example of a late Georgian working port and provides a permanent berth for three tall ships. A truly magnificent holiday home that literally oozes quality and sophistication. The Smokehouse development has only recently been completed and commands wonderful views of the sea and the splendid masts and square sails of the tall ships the Kaskelot and the Earl of Pembroke. Today the village of Charlestown remains relatively unscathed and retains bucket loads of character and charm. 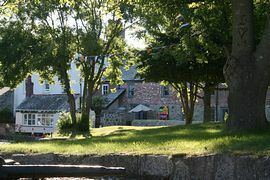 Two galleries, craft shops, restaurants, two pubs, two ice cream shops, coffee shop and Heritage Centre and not forgetting the two beaches await you just outside your door all add up to make this a truly remarkable place to stay. The ground floor has natural limestone floors with underfloor heating. The sympathetic treatment to retain period features whilst producing a comfortable and easily-run home, utilizes the best of today's interior design practice and materials. 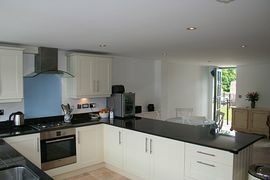 Shaker style cream kitchen with polished black Granite work tops. Electric oven, gas hob with extractor hood, integral appliances: fridge, freezer, dishwasher and washing machine. Extendable dining table - shabby chic in style. 32in flat screen TV with Sky package. 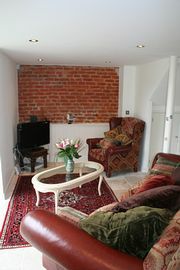 Enormous Tetrad sofa and armchair scattered with feather filled cushions. Bedroom One - Master Ensuite - large comfortable room with a king size bed, 17" LCD television complete with Free view En-suite shower room fully tiled with power shower and glass cubicle, hand basin and WC. Bedroom Two: Double bed with shabby chic furniture. Bedroom Three: Bunk Beds or single bed cot. A travel cot and high chair are provided. Please bring your own bed linen for the cot. Parking for one car. Additional parking available in harbour car park 20m from Seasalt - approx £2.50 per day. Come and let the magic of the Seasalt wash over you - be it paddling or swimming from the nearby beaches, gazing at the haunting beauty of the Tall Ships, fishing from the harbour wall or sitting silently in the garden and enjoying the peace and quiet and "get away from it all" atmosphere. This truly is a special place - the memory of which will remain with you for many years to come. 300 meter walk to beach. Seaviews in charming village location. Please contact us to discuss. There is a downstairs WC but no sleeping facilities on the ground floor. Bed linen provided except cot linen. Towels and tea towels not provided. Guests are kindly asked to smoke outside the property. Small garden, barbeque and seating area with table and parasol. 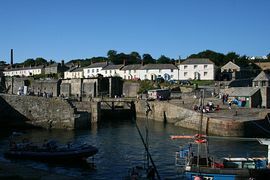 Local Services: In Charlestown village itself, spaced around the working harbour, a number of small shops and businesses contribute to the vibrant atmosphere. These include a bistro, pubs serving bar and restaurant meals, art gallery, post office store, day spa and natural health centre and the Shipwreck and Heritage. A feature of Charlestown life is its annual regatta that takes place at the end of July. On either side of the harbour entrance a few hundred metres from the cottage, attractive pebble beaches provide space to swim, play or just sit and reflect. The A390 is less than half a mile from Charlestown and provides access to Plymouth. The nearest motorway is the M5 at Exeter which is approximately 75 miles away and can be reached via the A391/A30. The nearest city is Truro, 16 miles to the west, and the nearest train station is at St Austell, just 1 mile away. Trains run regularly from here to Plymouth, Exeter, Bristol and London Paddington. Plymouth, just under 37 miles away, has a ferry terminal providing regular crossings to France and Spain. Newquay and Exeter airports are 17 miles and 80 miles away respectively, providing daily flights to Manchester, Leeds, Bristol and Jersey as well as four flights daily to London Gatwick. The cottage can be found at the edge of the harbour in Charlestown, opposite the Shipwreck and Heritage Centre on Quay Road and beside T'Gallants guesthouse and the ice cream shop on the roundabout. We are open all year and can be contacted 7 days a week between 9.00am and 10.00pm by email or telephone.